I must sound like a broken record with this wine. Here’s the review of the 2007. And the 2006. But really, it is my absolutely favorite Michel Schlumberger wine year to year. Of course….I don’t drink the Cabernet Sauvignon in my club shipments because I’m gathering a 10 year vertical to serve….well, it will have to be in a few years because I currently have 1998 through 2005. I’m almost there. Don’t you want to be my friend when I pop that open? Totally off point though. 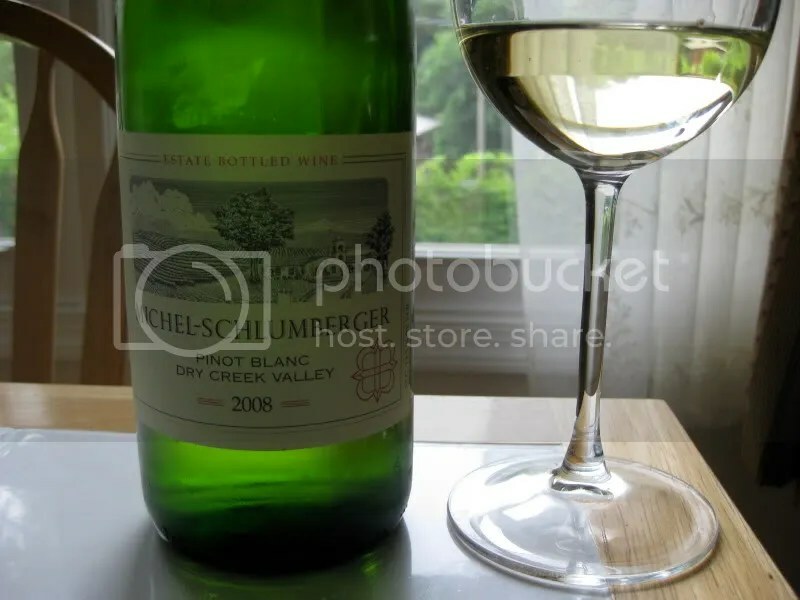 I picked the 2008 Michel Schlumberger Pinot Blanc to drink this evening. I’d been ITCHING to open it since it arrived in one of my recent club shipments. The Pinot Blanc sports a real cork closure, clocks in at 12.5% alcohol by volume, and I believe it retails for $21, though I got it in a club shipment and every M-S club shipment is $50 regardless of what’s in the box. On the nose of the Pinot Blanc I found sweet ripe pear, white peach, white pepper, a hint of honey, spice, lemon, honeysuckle, and white flowers. I liked this wine so much last year that I put it in the Summer Sipper Wine Blog Pack I helped design for Jill. In the mouth the wine showed lemon, peach, honey, ripe pear, ripe apple, melon, and a little essence of apple cider. Overall, it’s crisp, light, and consistently delivers a bottle of wine that I love. The first wine I chose for our hiking/riding/communing with nature trip was the 2007 Paul Blanck Pinot Blanc. Now, I love Pinot Blanc. Michel Schlumberger makes my favorite one currently. The Paul Blanck clocked in at 12.5% alcohol by volume, had a screw cap closure, and cost me $9.99 at the wine shop near work. It was on sale, usually it retails for $12.99. This fit square into my qualifications for an after hiking wine, and we really enjoyed it. On the nose I found the wine to be smoky, with spice, jasmine, flowers, lemon, nuts, and pear. In the mouth I got lime, lemon, spice, flowers, and more nuts. It was slightly on the sweet side, but chilled down enough I found it to be refreshing, and a good value for $9.99. 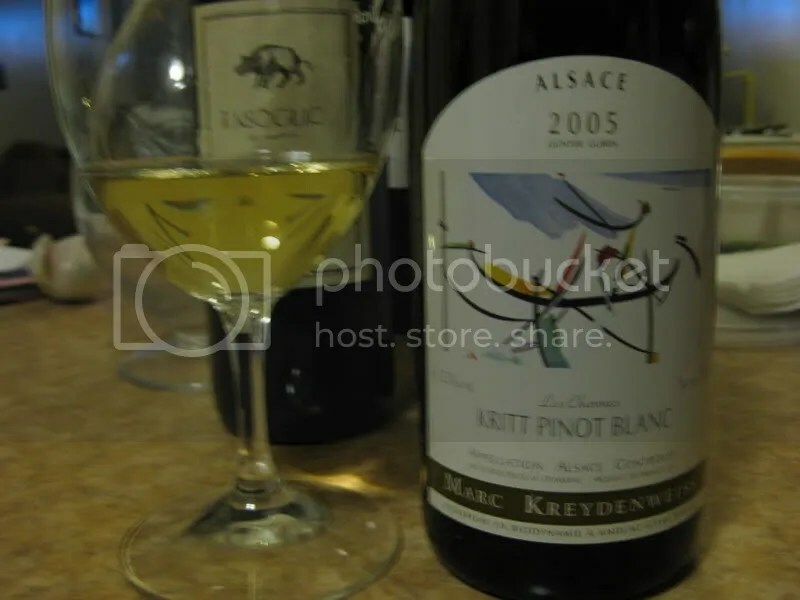 The first wine in the line up of the Twitter Taste Live Open That Bottle Night was a 2005 Marc Kreydenweiss Kritt Pinot Blanc. I unabashedly love Pinot Blanc. I’ve yet to meet one I don’t like. So it wasn’t much of a surprise to me that I enjoyed the Pinot Blanc the most of the 4 TTL wines. The wine had a real cork closure, clocked in at 12.5% alcohol by volume, and retails for around $18. I paid a bit less than that as part of the TTL tasting pack from Bin Ends Wine. On the nose I found pear, vanilla, minerals, apple, spice, green apple, peach, citrus, lemon drop, and stones. I loved the nose on this wine, one of those bottles where I wanted to keep smelling it. The 10 minutes I spent with my glass during the TTL seemed far too short. In the mouth I got flavors of pear, apple, lemon, citrus, minerals, apricot, honey, sweet peaches, slight tropical notes, and tart oranges. The wine had an overall full mouth feel and finish that kept going, and going, and going. At $18, this is a steal of a bargain for what you get in the bottle. I’d highly recommend this wine for the upcoming warm weather. 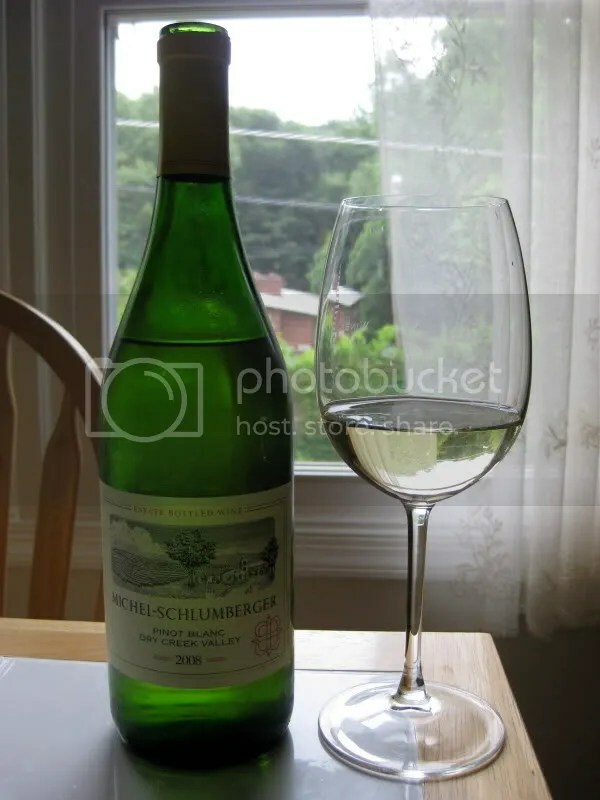 The wine for the evening was the 2007 Michel Schlumberger Pinot Blanc. The bottle came in a club shipment, but it retails for about $21. The wine had a real cork closure and clocked in at 12.8% alcohol by volume. Pizza and white wine probably represent one of my least elegant wine and food pairings, however, I wanted homemade pizza and I REALLY wanted to drink this wine, so there you go. I first became acquainted with Michel Schlumberger after reading about the winery on Fork and Bottle before our 2007 trip to CA. We stopped by to visit and immediately joined the club as we were so impressed with the quality of the wines. Since then, we have visited again, and I chose this wine as part of my Summer Sippers pack for Domaine547. We picked up this bottle of 2006 Chamard Pinot Blanc while visiting the winery in Connecticut. It cost us $17.99, clocked in at 12.5% alcohol by volume, and had a real cork closure. On the nose I found pineapple, tropical fruit, lemon, and minerals. In the mouth, apple showed through the most (odd because I didn’t get it on the nose at all! ), then some lemon and other citrus with underlying tropical fruit. Overall the wine was lively and acidic with good structure. We actually didn’t get to taste this one while at the winery as they weren’t pouring it that day, but I was really curious to try a Pinot Blanc from Connecticut so we took a few bottles home with us. Since the overall quality level of the wines were tried while there was very good, we didn’t think it would be that big of a risk to take home something untried. A good gamble in my opinion, this wine was very well done. 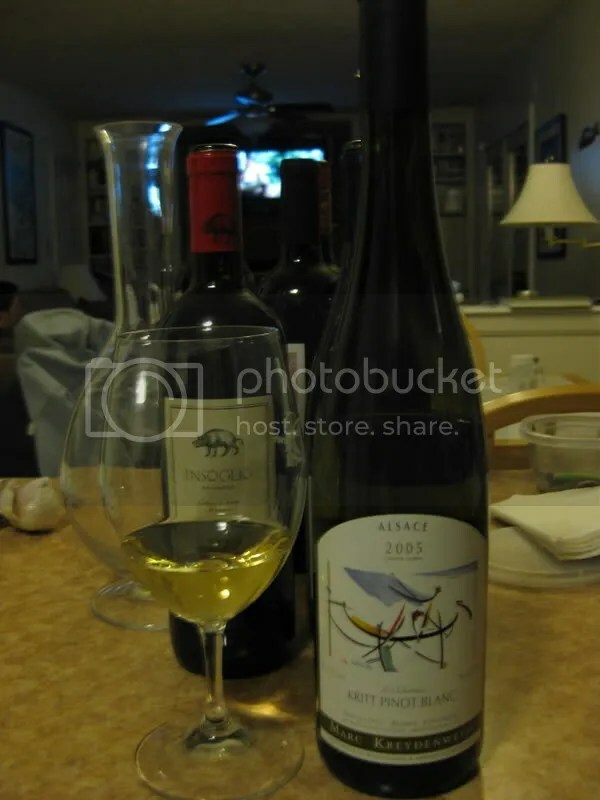 Filed under: Connecticut, Pinot Blanc, White |	Comments Off on Pinot Blanc. From Connecticut! We got this bottle of 2006 Michel Schlumberger Pinot Blanc on our recent trip to the Sonoma area. It was a perfect wine for the night we drank it, the thermometer was hovering around 92 degrees, but thankfully the humidity had not yet descended upon us. The wine had a real cork closure, cost $21, and was 12.5% alcohol by volume. On the nose the wine displayed pineapple, limes, lemons and tangerines, a veritable fruit salad of scents. It actually reminded me of a tropical drink and I could picture myself sipping it poolside….if we had a pool. A very aromatic bottle of wine. In the mouth, the wine was citrusy, showing lemons and grapefruit, very crisp and clean flavors. I noted the excellent acidity and structure of the wine and additionally the very clean and pleasant finish. I served the wine with parmesean encrusted baked tilapia, white corn and parmesean cous cous. It went perfectly with the fish. I wish I had another bottle for the hot days that are approaching! I’ve been off visiting the fam in CT for the past few days, so I apologize for my lack of posting! The dial-up there is not so conducive to even using the internet, let alone doing anything else on it. On Thursday (see, I told you I had a backlog of posts!) we went out to dinner at one of our local favorites, the Lebanese Taverna. My Dad was in town to do our housing inspection (which went very well, nothing major is wrong, we are proceeding to closing, yay!) and he loves the food there, but my Mom won’t eat it, so we always go when it’s just him visiting. The Taverna actually has a really interesting and fairly diverse wine menu, including many selections from Lebanon. We’ve tried several of those in the past and have always liked them. 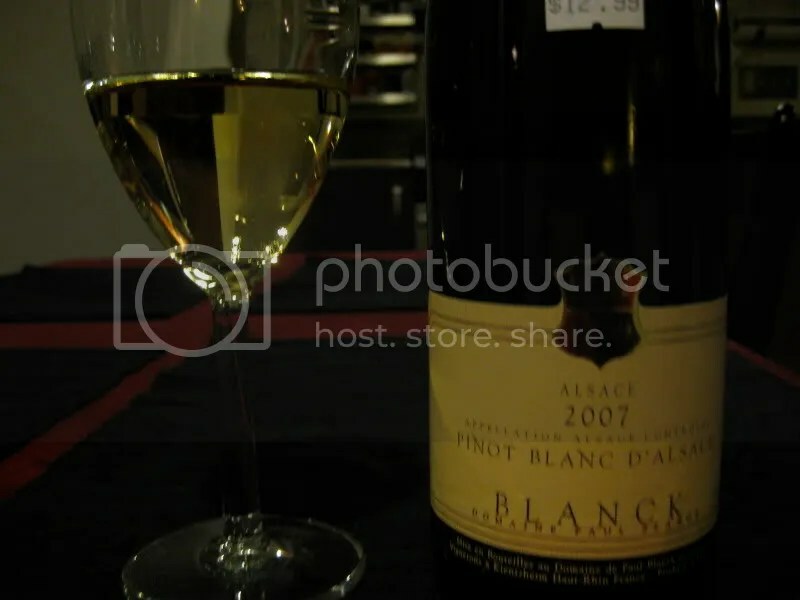 However, my eye was drawn to a bottle of Pinot Blanc from Alsace, because I was thinking of the WBW hosted by Fork and Bottle a few months back where I had a biodynamic bottle of Pinot D’Alsace, which was a different blend, but had Pinot Blanc in it. Back then, I had wanted to find the same varietal from the same location and taste them side-by-side, but couldn’t turn up a non-biodynamic one fast enough. 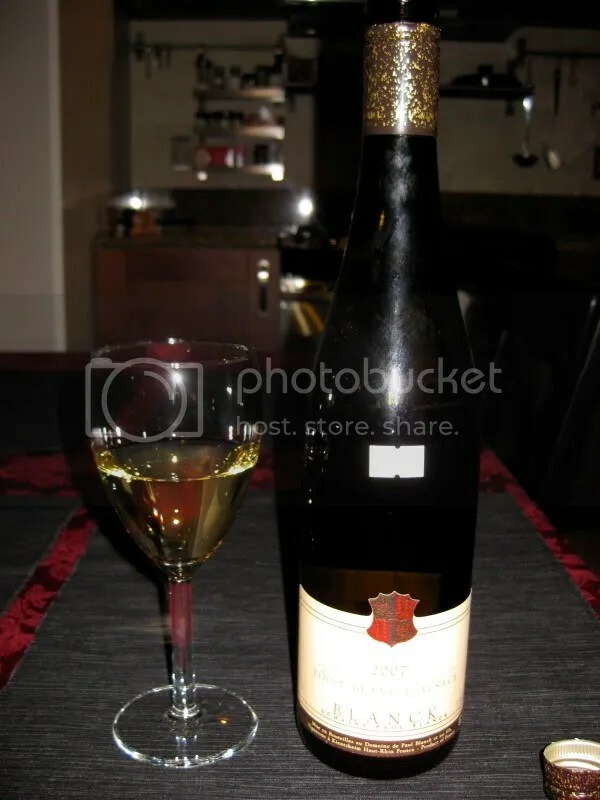 When I saw the bottle of Pierre Sparr 2004 Reserve Pinot Blanc, I had to get it. The basics: restaurant priced at $31, though I see you can find it here for $11.99, it’s 12.5% alcohol by volume and had a real cork closure. On the nose of this bottle I got lots of green apples. It was very floral and aromatic, a very good nose. In the mouth, I found minerals, more green apples and just a slight citrus quality. The finish was quite long, with the crips flavors lingering in the mouth. Overall, this was a very good wine and a great choice for dinner. We all had some variation of beef and lamb shwarma, which had a bit of a spicy kick to it, and the wine lent itself nicely to flavors. In terms of comparing this bottle to my WBW bottle, I don’t think that after drinking them, the comparison is fair, and I’m not sure I will every get a fair comparision, since the blend I drank for WBW only had 30% Pinot Blanc grapes in it, and though I can’t find information on what grapes other than Pinot Blanc (if any) were used in this bottle, I’m fairly certain it was a higher percentage than 30% Pinot Blanc. Oh well, just an excuse to keep trying other ones!